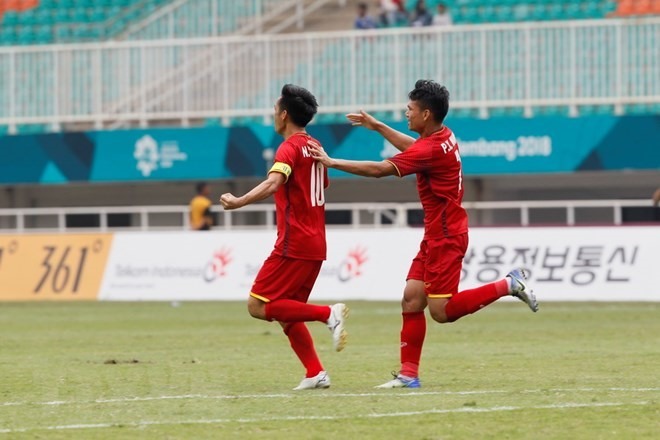 The Việt Nam Olympic team lost to the United Arab Emirates (UAE) 3-4 in a tense penalty shootout after drawing 1-1 in official time of the third-place play-off match of the men’s football at the Asian Games in Indonesia this afternoon. The game took place at Pakan Sari Stadium. Việt Nam dominated proceedings from the opening whistle. Vũ Văn Thanh nearly scored the opener for the Vietnamese side in the second minute but UAE’s goalie Mohamed Al-Shamsi managed an impressive save. It was UAE who opened the score in the 17th minute. Alhashmi Ahmad shot from outside the penalty box to beat Vietnamese goalkeeper Bùi Tiến Dũng. Boosted by their goal, UAE continued to play long shots and threaten the Vietnamese net. In the 27th minute, from a spectacular co-ordination, striker Nguyễn Anh Đức passed the ball to Nguyễn Văn Quyết who didn’t miss the chance to score the equaliser for Việt Nam. In the closing minutes of the first half, Việt Nam had the chance to raise the score with a quick free kick but the shot from midfielder Nguyễn Quang Hải was blocked by a UAE defender. After the break, both sides fought back strongly to seek goals. UAE missed a chance in the 46th minute when Alameri Zayed’s shot hit the crossbar. In the 56th minute, Việt Nam were awarded a free kick from the right. However, Thanh’s shot was stopped by the UAE’s defence. In the 67th minute, Hà Đức Chinh tried his luck with a shot but couldn’t beat the goalkeeper. After that, striker Quyết was injured and was subbed out for Phan VănĐức. In the remaining minutes, both teams had several chances to advance the score but were unable to capitalise. The game went to a penalty shootout. Al-Attas, Zayed Al-Ameri, Khaled Ibrahim and Shahin Suroor all made no mistake in converting from 12 yards but, while Thanh, Chinh and Phan Văn Đức did the same for Việt Nam, Hải fired the second effort inches wide of the post having sent Al-Shamsidiving the wrong way. That left Vương needing to score their crucial fifth penalty but Al-Shamsi produced a fine save, pushing his shot onto the bar and back out to break Vietnamese hearts and seal the bronze medal for UAE following a 4-3 shootout triumph. Earlier, Việt Nam enjoyed a smooth passage tothe third-place match by topping Group E with a perfect record of three wins.They then saw off Bahrain in the round of 16 and Syria in the quarter-finals. They lost 1-3 to South Korea in the semi-finals. In other news, Việt Nam won another silver medal in sepaktakraw in the women’s fours event after losing to Thailand 0-2 in the final today. Ealier, Việt Nam also won bronze in the men’s fours event after losing to Japan 0-2 in the semi-finals. In the ASIAD 2014 held in Incheon, South Korea, the Vietnamese female sepaktakraw team brought home a bronze medal. While it is the first time the male team have earned a medal at any ASIAD. Việt Nam have won four golds, 16 silvers and 18 bronzes to rank 17thin the medal tally. China take the lead with 123 golds, 87 silvers and 63 bronzes. Japan and South Korea are the runners-up.